My wife’s school recently sent round a form with questions about “a day in the life” of people working in STEM careers, to show to their year 6 children. My job involves the M in STEM, so I agreed to have a go at describing my day. I quite enjoyed describing about what I do, so I’ve decided to reproduce my answers here. Enjoy! When I worked for the MSOR Network under the National HE STEM Programme, we funded a project called Being a Professional Mathematician which was run by Tony Mann (University of Greenwich) and Chris Good (University of Birmingham). This included the production of a set of audio interviews with mathematicians about their work and historians about historical mathematicians. This audio is now available to listen to in podcast format. Get the Being a Professional Mathematician podcast in RSS format. Get the Being a Professional Mathematician podcast on iTunes. The wider project includes resources and suggestions for using this audio in teaching undergraduates, inclunding the booklet Being a Professional Mathematician. 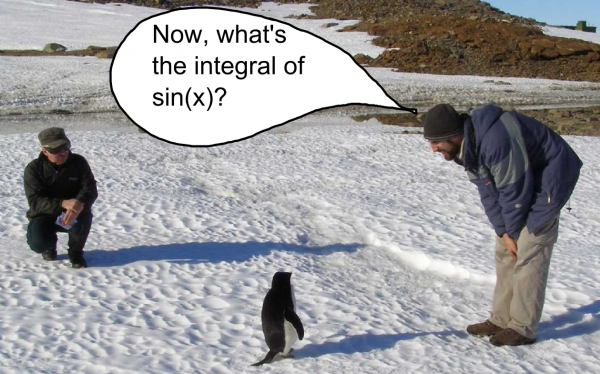 Why Should Penguins Care About Maths? I regularly review resources written for pupils and teachers that in some way aim to support or extend Science, Technology, Engineering and Mathematics (STEM) education. The most recent campaign in the UK is the Your Life campaign and as usual it has a website with short articles designed for teachers and pupils to browse and be inspired. Imagine my excitement when one of the articles was called “Why Do Penguins Care About Maths?”. Two of my favourite things together in one article, there was even a video. I imagined something about penguins going North, then East then South on their quest for fish and ending up close to where they started. How does the problem change for a beady-eyed Rockhopper over a majestic (but slightly ridiculous) Emperor? How far does a penguin swim anyway? How do you map three-dimensional movement as it glides up and down under the water? So many possibilities for penguins and maths. What colour shirt do mathematicians wear? Readers of The Aperiodical may recall three excellent posts on the Maths of Star Trek by Jim ‘But Not As We Know It’ Grime. At the same time, Jim discussed the topic in glorious audio with Andy Holding and Will Thompson, hosts of the Science of Fiction podcast (worth listening to, but at least visit the page to see a picture of Jim nursing a tribble). As part of this, the hosts asked Jim what uniform colour mathematicians on the Enterprise would wear. JIM: Science and medics, those are the blue shirts. HOST: Where do mathematicians go? Scientists? JIM: That’s right, yes, science. JIM: Yes, I am, I’m in the blue shirt category. Jim is pleased to say that mathematicians wear blue because, as he explains, gold and red uniformed crew were much more likely to be killed during the famous five-year mission than those in blue. I’ve written in the past about maths and mathematicians being everywhere, for example when asserting that most of the Nobel prizes are for mathematics. Was Jim right about those blue-shirted mathematicians? Mathematical and statistical software specialists The Numerical Algorithms Group (NAG) are advertising a twelve month student placement in Oxford as a software engineer. We are looking for somebody who has completed the equivalent of two years of a three-year degree course. A strong computing component in the course is important and some mathematical background or experience using software to solve scientific or engineering problems would be a big advantage. The ideal candidate should have experience of programming in a Windows, Unix or Linux environment. Some knowledge of C or Fortran would be useful, but is not essential. The deadline is 31st January 2013. Further details: Student Placement: Software Engineer. via Mike Croucher on Twitter. The Guardian is reporting that the Government Communications Headquarters (GCHQ) is to trawl social networks for intelligence. The Cheltenham-based organisation is recruiting maths, physics and computing experts to devise groundbreaking algorithms that will automatically extract information from huge volumes of speech, text and image content gathered “across the full range of modern communications media”.